Can you remember being the new kid of the block? How about starting your first job as a green-behind-the-ears (OK – maybe there wasn’t moss growing behind your ears) 16-year-old? Trying out for the football or basketball team and the other kids were so much BIGGER than you? How about pledging a fraternity or sorority and wondering (back in the days of hazing) what “hell night” would be like? Being a rookie, a beginner, a new comer, a pledge, an apprentice – or even called a “tenderfoot” (that’s a funny word) is an exciting, yet fearful adventure. 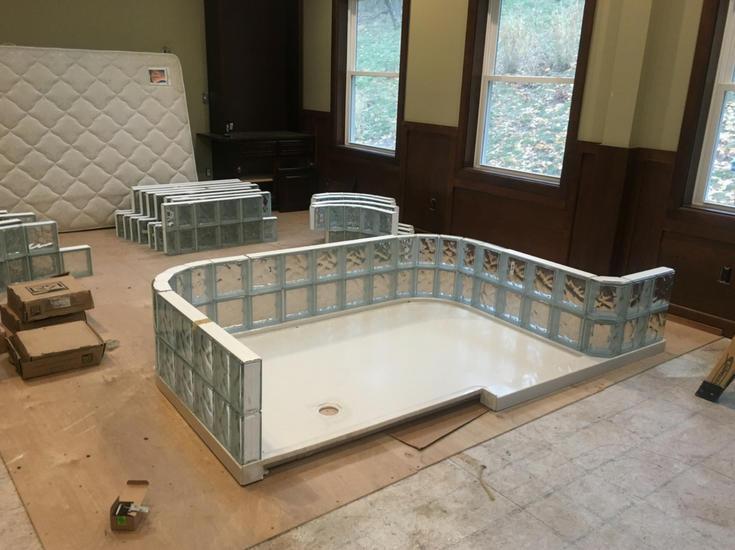 Home improvement projects done for the first time can bring back the fears you experienced in the “Wonder Years” of your youth (my life was practically joined at the hip with Kevin Arnold if you remember him on this show). 95% of the people I advise on building a glass block walk in shower are rookies, first-timers. It doesn’t matter if they are roll-up-your-sleeves DIY homeowners or grizzled professional contractors who have lived through more than a few drain holes and literally “sweated” in more valves than they can count. You know it’s possible to build these cool looking showers. Your spouse (or customer) has shown you countless images she’s been pinning the daylights out of on glass block showers on Pinterest. Now she wants YOU to make it happen for her. 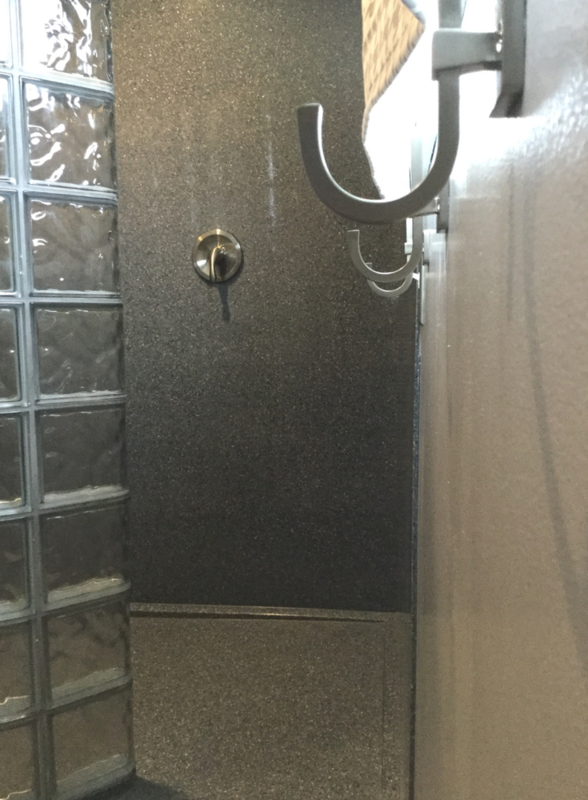 Ouch – how are you going to turn this glass block shower picture into a reality without creating the nightmare on Elm Street bathroom remodeling project? 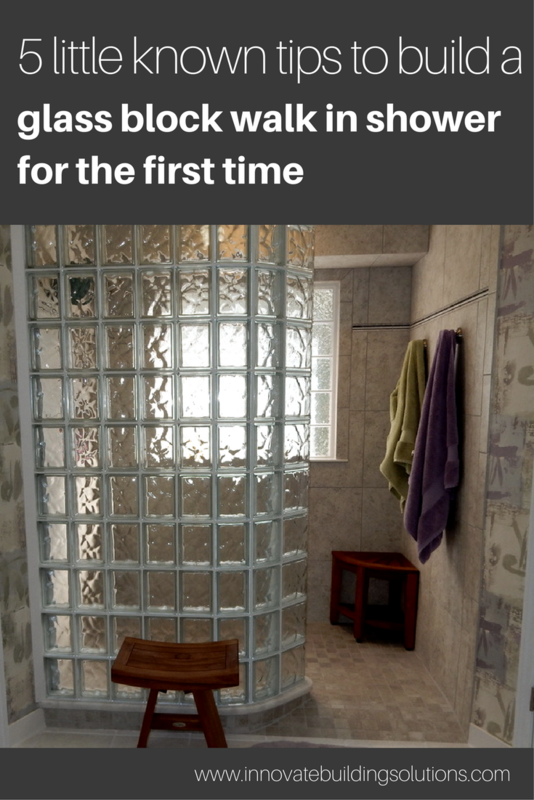 Just like in the old-days of your youth you’ll need to find the right tools, kits, advice, systems and sage advice to make it successfully out the other side of your first-time glass block shower project. Building a glass block shower wall is not difficult – IF – you use these 5 little-known tricks. Let’s check them out. Since glass blocks cannot be cut you need to (as Steven Covey would say) “begin with the end in mind.” Know your design. Know it’s shape, size, where the opening will be before you do anything. Don’t build a shower base, demo a wall, or move plumbing without a game plan. The challenge becomes how can you figure out a design when you don’t know what the heck you’re doing? The best tool to help you through this challenge are glass block layout cards. These “puzzle-like” pieces mimic the size of the glass blocks plus a small 1/8” grout joint between them. Is the opening large enough for everyone? Will the shape of this wall (whether it’s curved or straight) keep the water in? Which glass blocks can (or should) I use to get the right finished size and look I’ll be proud of? Remember as a kid buying a Revell model car kit and putting together that ‘66 Mustang you spruced up with little Testor paint bottles. Boy there was a lot of fun in those boxes. Those kits made the job easier – plus Mom and Dad weren’t planning on buying you the real thing (you probably needed to get your license – and some money first!). The best way to make a glass block walk in shower infinitely simpler (just like in your old days of putting together the model cars) is to buy a kit. Forget going to the big-box stores. Picking up a few boxes glass blocks, some bags of mortar and trying to figure this thing out yourself. You’ll waste a lot of time and end up with an ugly project. Get a glass block shower kit which includes the shower pan (designed to fit the walls), prefabricated and pre-curved shower sections and even grout free wall surrounds for the ultimate low maintenance shower. Growing up you watched the Senior guard on your high school basketball team dribble through opposing defenses. Even though you were “only” a Freshman on the JV you could ask him for pointers and see yourself in three short years besting his feats on the court. What’s cool about building a glass block shower today is you don’t need to face to face contact with someone to learn the how it’s done. It’s as simple as watching (and re-watching) YouTube videos to see how to install a glass block shower. One – little-known system makes putting a curved glass block wall together as simple as Lego blocks. It is called a Protect All glass block shower wall. It uses vinyl strips vertically and horizontally through the wall for stability and ease in anchoring the glass wall. The blocks are pre-assembled in sections, so you’ll simply stack one section on another to make your project a reality. Little known glass block walk in shower tip #4 – Remember Dad’s sage advice. A penny saved is a penny earned. Look for ways to save money on plumbing. Have you ever moved plumbing in your bathroom? If so – you know it can be difficult and require an expert (yes, this will mean hiring an expensive plumber). One little known fact about glass block showers is there is a way to not only do away with expensive plumbing costs – but also to get a waterproof shower at the same time. 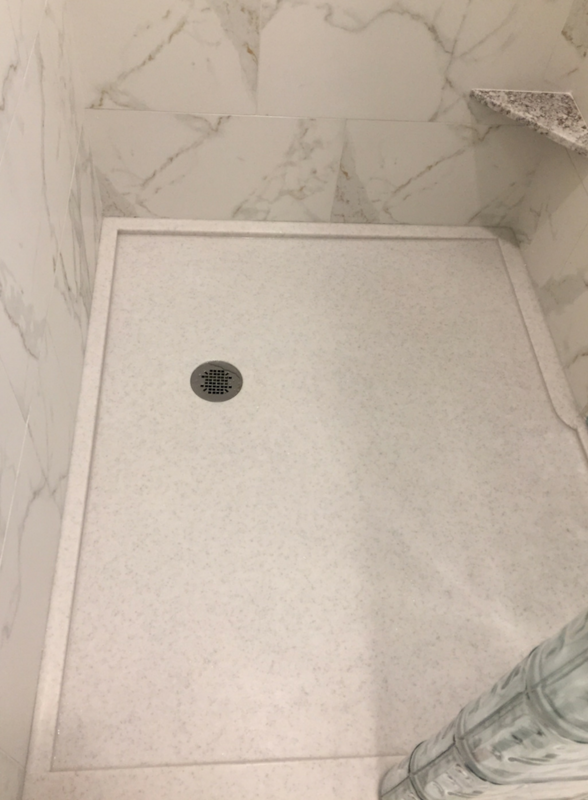 You can make this happen by purchasing a premade ready for tile or solid surface shower pan where the drain hole is located in the same place where you current drain is today. Even if you’re changing (likely) the size and shape of your shower, you can use the same hole to eliminate re-routing your plumbing. 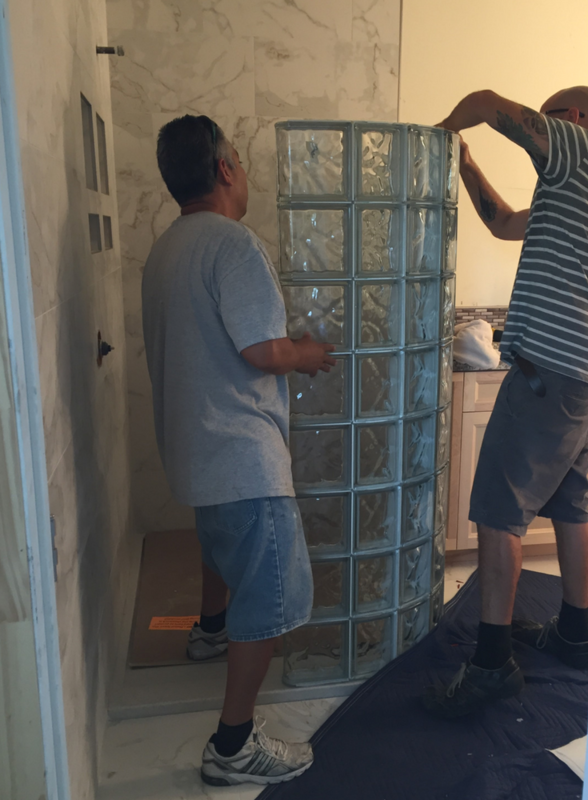 As a first-time glass block walk in shower installer you will be able to hear Dad’s words proudly ringing in your head, “Son – a penny saved is a penny earned.” Look for ways to save on your shower project while also improving quality. Remember at your first professional job finding a mentor you wanted to be like. They were neat. They were professional. They were on top of their game. They treated you well. In my first full-time professional job I was a Marketing Management Intern at a cutting tool manufacturing company called Cleveland Twist Drill. My mentor was a guy named Bob Baris. Bob was the consummate professional. His desk was neat. He had a system to get things done. He was patient with me (I was motivated to work hard and succeed– yet sometime was reckless and had to be taught how to get things done without ruffling too many feathers). It’s nice to know today’s modern glass block shower installation systems would be approved by my mentor Bob. The old way of installing a glass block shower used a mason laying the blocks one by one with mortar. It was sloppy, time consuming and cost A LOT of money (if you can find a mason willing to do the job). Most masons hate glass blocks because they take a lot longer to install than a brick or block. Today, the best systems are neater and more efficient. 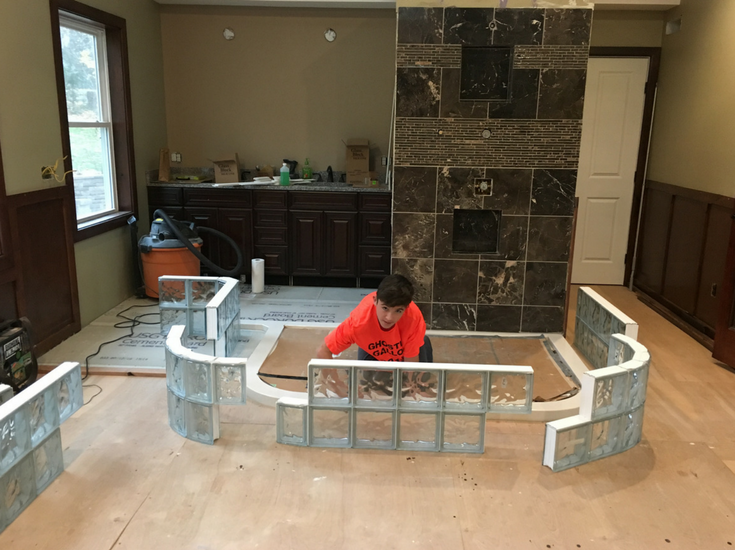 Using prefabricated walls, you’ll end up with 1/8” grout joints (vs. the large ¾” mortar joints you’ll see on the outside of a curved glass block wall which is put up by a mason block by block) and you don’t need a mason to install them. You, or your contractor, just need to be handy and follow instructions. It’s nice to have a better quality finished project where you’ll make less mess and dust in the process! Your wife and customer will be grateful. Projects done well are not about being stubborn and thinking – I “know it all.” It’s smart to admit you’re a rookie. Seek knowledge and mentors. Perhaps you’ll find a “Bob-Baris-like” mentor (a person to help you along the process). Here’s my shameless plug. I would be glad to be this person for you like I’ve been with many others throughout the years. Perhaps you’ll need to get layout cards to do a rough design before starting to demo. Don’t be afraid to ask for help, watch videos and do your “homework” (OK – that word may still give you sweaty palms). It won’t be tough (I promise) to build a glass block walk in shower – IF – you follow these tips. How can I (or my team) help you with this project? For assistance with how to build a glass block shower on a nationwide basis call us at Innovate Building Solutions at 877-668-5888. For a local installation service and supply contact Columbus Glass Block at 614-252-5888 or Cleveland Glass Block at 216-531-6363. I want to add a glass block wall to my existing shower to close the opening about half way so i don’t have to hang a curtain anymore. 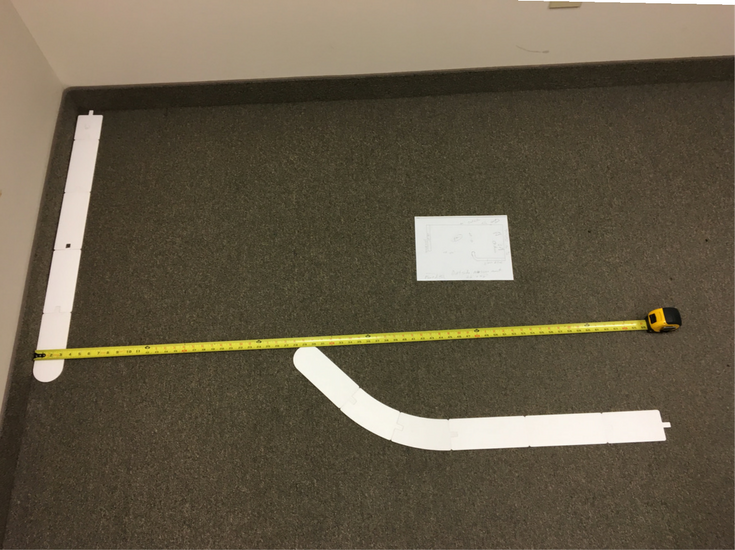 What is the best way to lay the blocks and anchor them to the tile floor? They will be on a lip so they will not be flush with the pan but i do not see anything anywhere explaining how to attach them to existing tile.